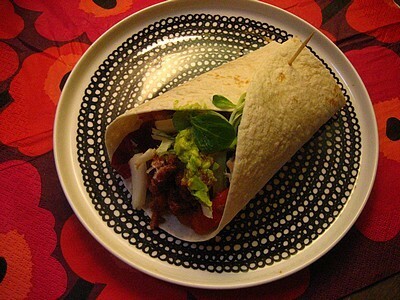 Vegetarian Fajitas are easy to prepare, tasty and perfect food to share with friends. But tonight I made some just for myself and ate while watching my favorite tv show. Cut one big onion, one red sweet pepper, a carrot and one red chili pepper in slices. Fry in a wok and add some dark soy mince, red kidney beans, tomato sauce, garlic, salt and pepper and let the whole thing cook for a while. Prepare some guacamole, green salad and Parmesan cheese. Warm the tortilla bread on a frying pan or in the oven before you spoon some filling onto each tortilla and roll up! You can try different variations: lentilles, tofu, different vegetables, hummus, yogurt sauce, sour cream, different types of cheese… You’ll find that most of the things work. Next PostSometimes out of the blue arrives a sweet evening.